We have to move from E-governance to M-governance. M-governance does not mean Modi governance. It means Mobile governance, the PM said. Articulating global worries over cyber security, Prime Minister Narendra Modi on Wednesday said India should come up with solutions to meet the challenge posed by this threat of "bloodless war" as he launched a digital campaign to which top companies pledged Rs 4.5 lakh crore. Inaugurating 'Digital India Week' here, he pitched for a digital revolution in the country, saying it is necessary to deal with problems like corruption, help provide transparent and efficient governance and bridge the rich-poor divide. "We have to move from E-governance to M-governance. M-governance does not mean Modi governance. It means Mobile governance," he said in the presence of several ministerial colleagues and who's who of Indian industry and CEOs of some global companies. The prime minister noted that India has huge capabilities in the field of IT and promised to encourage manufacturing within the country of electronic goods, which account for second largest imports after petroleum products. He specifically mentioned start ups in this regard. While highlighting the advantages of the IT, Modi said, at the same time, "clouds of a bloodless war are hovering over the world. The world is terrified by this....India has a big role to play in this. "Can India play this big role? India has talent. Can India provide a shield to the world by providing innovative and credible solutions? Why should we not have such a confidence? 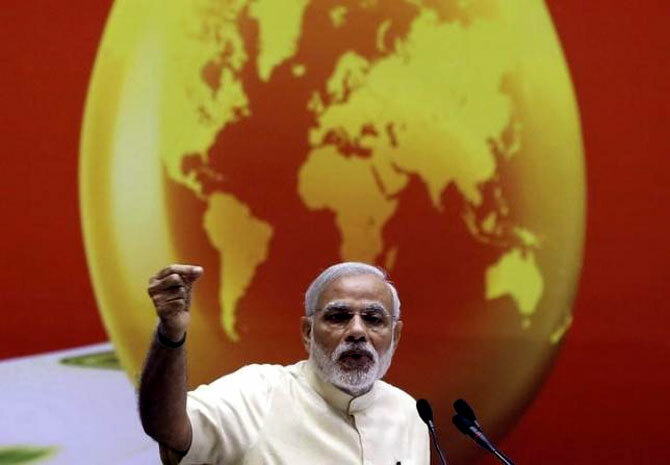 We should accept this challenge to ensure that the entire humanity lives in peace," Modi said. While talking about dangers posed to cyber security, he said, "somebody, with education of 10th or 12th class, sitting thousands of miles away, can clean up your bank account with a click of mouse." This situation needs to be addressed, he said. Noting that India had lagged behind when the world went through the industrial revolution, the prime minister said he dreams of a "Digital India' where government services are easily available to citizens on mobile devices. The function was attended by RIL chairman Mukesh Ambani, ADAG chairman Anil Ambani, Bharati Enterprises chairman Sunil Mittal, Tata Group chairman Cyrus Mistry, Aditya Birla Group chief Kumarmangalam Birla, and Wipro's Azim Premji. From among the global companies, Bernhard Gerwert, CEO of European consortium Airbus' Defence and Space unit, and Ping Chang, CEO of Taiwanese company Delta Electronics, attended the event. The industrialists made announcements regarding their intention to invest in digital sector, which the prime minister said amounted to over Rs 4.5 lakh crore with a potential to generate 18 lakh jobs. Mukesh Ambani announced an investment of Rs 2.5 lakh crore over five years and said it will result in creation of 500,000 jobs. He said his company was working with device makers to make affordable devices. Birla promised to invest $7 bn in next 5 years in network rollout and infra and digital space. Mittal committed to invest Rs 1 lakh crore in next five years in digital space while Anil Ambani promised to invest Rs 10,000 crore (Rs 100 billion) over next few years across digital, cloud and telecom space. Delta CEO pledged $500 million.